Kidd and Shaq: Were They Worth It? The first round of the NBA Playoffs have been extremely entertaining so far. But I want to take a break and look back at some of the North Carolina Tar Heels that have declared for the NBA draft this year. Ty Lawson played phenomenally to start off the season. He had the Tar Heels’ high octane offense moving fluidly. He got everybody involved in the game and had cutdown on his careless turnovers. Lawson’s strength has always been his incredible speed. He was like a blur running past opponents so many times during the year taking the ball coast to coast. However, after suffering from the ankle injury heard around the world, he never got back to full strength. Lawson became more tenative, he lost his explosion, and could not get the team clicking together again. There were flashes of promise when he would penetrate and finish strong at the hole, but it was not the same explosion. In addition, he was a complete no-show in the ebarassing loss to the Jayhawks in the Final Four. But now, Lawson has entered his name for the draft but will not be hiring an agent. I really believe Lawson could use an extra year in college to help his game, especially after the injury. This year’s draft is stacked with point guards ranging from, OJ Mayo, Jarryd Bayless, to DJ Augustin. Lawson is still not at the same tier of play as the players mentioned. His other problem is his lack of size. When was the last time an under 6 foot point guard survived in the NBA? If Lawson stays at UNC for one more year, he will be able to help his draft stock immensley, unless he gets injured again. I predict he will be drafted late in the first round or early secound round. Ellington can straight up shoot lights out. He has one of the smoothest jumpers in the game today. He has improved his game dramatically from his freshman year to his sophomore year. He has expanded his sweet three point jumpshot to more of a slashing offensive game too. Anyone that watched his assasination of Clemson three times this year, knows the scoring outbursts he is capable of. However, Ellington has not shown that he can be consistent. While he was the secound leading scorer for the Tar Heels, he was a no show in the NCAA Tournament. His three point shot was not falling in the tournament and he struggled. But the main thing is Ellington has so much upside. If he can bulk up in size, he will be a decent NBA two guard. He has the potential to be more of a Paul Pierce player than a Rip Hamilton player. Staying in college, could help Ellington expand his offensive game even more and allow him to work on his defense which is non-existent. I predict, Ellington will be a drafted between the 18-24 picks in the first round. Green was the best sixth man in the country this year and even had some dance moves before the home games for fans to get hyped about. Green was a solid contributor this year for the Tar Heels He was instant offense for them off of the bench, and played quality defense by blocking shots at a ridiculous pace for a player of his size (6’6″). Green too has declared for the draft without hiring an agent. I don’t think Green will have a chance in this year’s draft. He does not have the up-side that Marvin Williams had when he was drafted as the number 2 pick while coming off the bench for the Tar Heels in 2005. Green would be the starting 2-guard next year if Ellington remains in the draft and would have a chance to be a secondary scoring option after Tyler Hansbrough. If Green chooses to remain in the draft, it would be a bad call. It would be a stretch to say he is drafted late in the 2nd round. While there have been stellar players picked in the 2nd round such as Gilbert Arenas, Manu Ginobilli and Carlos Boozer; Danny Green is no where as good as those players. I predict, Green will not be drafted and if he does it will be in the late secound round. Tyler Hansbrough returns back to the Chapel Hill in hopes of winning that elusive National Championship. He will continue to shatter numerous UNC and ACC records on his way to winning his second National Player of the Year Award. I could keep on going about the guy, but let’s save it for next year when he’s forced to leave college. After 5 games each, the Suns and the Mavs have both been given the boot from the first round of the Playoffs. It’s really ironic that both teams made blockbuster trades during the trade deadline and it has backlashed against them. Now they have both stumbled into the offseason. Jason Kidd was a whiner who gave up on the Nets even while they still had a realistic chance to make it to the playoffs in the weak east. He drove Byron Scott out of New Jersey and made the Nets brass decide between him or Scott. Then he feuded with Lawrence Frank and cried his way out of the swamp in NJ. He was supposed to be the missing link for the Mavs and Mark Cuban was willing to gamble and take on the title as the team with the highest payroll. But Kidd never brought his magic with him to the Mavericks. Now, less than 24 hours after the game 5 loss to the Hornets, his newest coach is gone too. Does Avery Johnson deserve the blame for the loss. Sure, every coach gets blamed for not winning a championship. But, I really believe that Cuban and the Mavericks management opted to keep players such as Kidd happy rather than Johnson. Granted Johnson was going to get fired anyways after three disappointing playoff appearences; however, I believe a large reason for his firing was because of Kidd’s contract on the payroll and his lack of defensive presence on the court. If the Mavs did not trade for Kidd, they would have still had Devin Harris and Diop. While they are not superstars, they are young players that knew how to play their specific roles on the team. Harris would not have been able to stop Chris Paul either, but atleast he would have been able to stay in front of Paul unlike Kidd’s creaky knees. Diop, one of the most unpolished offensive players in the league who makes Shawn Bradley look like Tim Duncan in the post would also have had an impact. His athleticism would have kept Tyson Chandler off of the boards and prevented the Hornets from getting so many offensive rebounds. Jason Kidd couldn’t fulfill the Mav’s wishes when they agreed to take on his huge contract and now he has indirectly caused another coach to be fired. Byron Scott was probably so glad that Kidd was traded to the Mavs, because Chris Paul has allowed him to enjoy sweet revenge against Kidd. On the flip side, the most dominant big man to play the game in this generation, Shaquille O’Neal gave up on the Heat early in the season. When Wade went down early in the season, Shaq refused to pick up the slack to carry the team until Wade recovered. Sure, he’s older and fatter now, but the effort was never there. Like Kidd, he cried and whined his way out his former sinking team. Shaq used his charismatic personality to win over the Phoenix fans even though they did not have a spectacular record after Shaq’s arrival. But now after the Suns’ third loss in the playoffs to the Spurs in four years, it now looks like Mike D’Antoni is going to get the axe. Ever since, Steve Kerr took over the Suns VP job, it has been clear that him and D’Antoni don’t see eye to eye. D’Antoni has refused to preach defense, while Kerr has brought in Shaq for defensive purposes. After the 5 game thrashing the Spurs have laid on the Suns, its clear that Shaq is simply too old and overweight now. He cannot play defense and has no lift in his game. The loss of Shawn Marion was clearly evident as the Suns had no one to match Tony Parker’s speed. Tim Duncan simply destroyed Shaq in the post time after time. Furthermore, the biggest downfall has been because of Shaq’s free-throws. When you get paid twenty million dollars a year, you should be able to make 75% of your free throws. Free throws are a learned skill. It is not something you are inately born with, but something that takes practice and dedication to learn. However, being able to dunk over 7’6″ players is an innate ability that does not require skill, but talent. But Shaq does not have that discipline to work on his free throws and that has always been the knock on his game. He has been able to mask it in the past, because of his dominant presence in the post. However, during the Spurs series, Shaq’s free throws cost them the series. For example, in Game 5, Shaq alone took 20 free throws and missed 11 of them. That’s just pathetic and unbelievable for a player of Shaq’s NBA status. If he had made more free throws, the Suns would have won the game, and some of the previous games might have been closer. Shaq has been literally a big baby throughout his career. He conflicted with Penny Hardaway in Orlando, the never ending feud with Kobe and then the cheap shots he took at Pat Riley after he reached the desert. One can only wait to hear what he has to say about Mike D’Antoni and Steve Nash after this loss. Jason Kidd and Shaquille O’Neal, two of the superstars of our day have just demonstrated that the grass is not always greener on the other side. They both bailed out when their former teams were struggling in hopes of joining new teams to win a championship. I guess karma does catch up to you eventually! Mr. Magoo heads to Charlotte. Larry Brown is a great coach and a genius with the X’s and O’s. I used to like Larry Brown as the Carolina alumni, Pistons coach and Sixers coach. But after the Knicks fiasco, I really don’t see Brown as the coach for the Bobcats. As the coach of the Pistons, Brown had a well established veteran team assembled. As the Sixers coach, Brown had Allen Iverson and was only able to reach the Finals because Iverson literally carried the team on his back. But when Brown got to Gotham, he was supposed to mesh a bunch of young players together and restructure a team to prominence. Clearly he failed. He was unable to get through to the young players and constantly conflicted with the players. I dont’t think Brown is the right coach for the young Bobcats. Brown is a good coach, but not a great teacher. The Bobcats, need leadership and a teacher at the bench. And Brown does not fulfill these criterias for Charlotte. 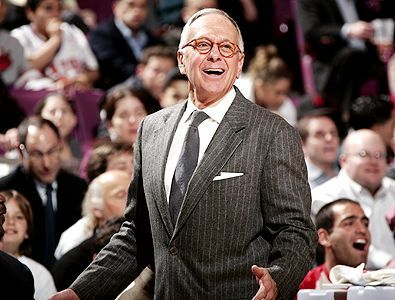 I can see Larry Brown as the head coach of the Boston Celtics or the San Antonio Spurs, but not a young team. I actually consider Brown the Rasheed Wallace of coaches. He’s an amazing coach, but he brings so much drama to the bench like Rasheed. He takes the focus away from the team from his antics and has a history of bailing on teams when times get tough. I could be completely wrong, but from Brown’s disaster in New York, he’s not the coach for a promising and young team as the Charlotte Bobcats. Let’s hope he doesn’t stunt the growth of Raymond Felton, Emeka Okafor and Gerald Wallace. Mr. Magoo – You’ve destroyed my favorite team, the Knicks….don’t destroy my other team too. The first round of the NBA Playoffs have been full of surprises. Unexpected teams have shown flashes of brilliance and relentless effort while some of the big guns have shown more vulnerability than ever before. The disappearing acts being performed by the Phoenix Suns and Dallas Mavericks continue to highlight the playoffs this year. 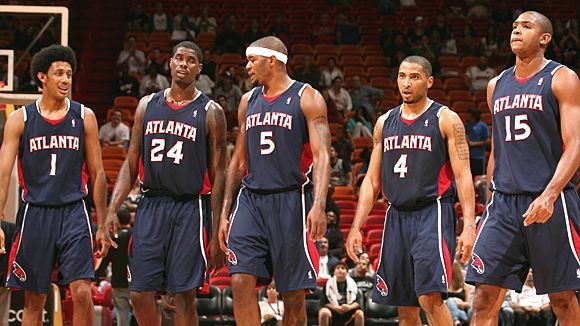 The Atlanta Hawks and Philadelphia Sixers have been the teams that have surprised everyone so far. They both squeaked into the last two spots of the playoffs and were both expected to be swept. Yet, the Sixers have been a solid team handing the second ranked Pistons two losses and have the series knotted at 2-2. They have been very impressive for a young team that was expected to finish last in the Atlantic Division. While the Hawks got spanked in games 1 and 2 in Boston by an average of 21 points, they showed why they are such an entertaining team in game 3. All you need to know is Josh Smith has serious hops. The guy definitely has springs in his legs. His 27 point, 9 rebound performance and the help of Al Horford’s dominant contribution in the post (and taunting of paul Pierce) showed a promising future for the baby Hawks. While, I don’t see Hawks or the Sixers winning their series’, both teams have provided fans with enteraining games and have had a chance to display some of their great young talents. It has been less than two weeks since the playoffs have began, but the excitement is high now. Hopefully, the second round will promise us the same excitement. Extra: No multimillion dollar NBA facility should have shot clock malfunctions like the Hawks did in Phillips Arena. The PA announcer was counting the shot clock down at 15, 10, 5, 4, 3, 2, 1 seconds through out the 3rd quarter. It must have been quite embarrassing for the owners/managers of Phillips Arena. As expected, Michael Beasley, Kansas State’s sensational phenom will be announcing his choice to enter the NBA Draft after one year of college basketball. This has to be the best race for the Western playoffs in years. 9 teams fighting for 8 spots. Well, 7 teams have locked up a playoff spot and two are fighting for the 8th seed. Also, the 2008 MVP will also be coming from one of the top two teams in the West. Chris Paul and the Hornets are having a surprising and amazing season. They currently own the number one seed in the West and manage to play a great game of team basketball (very similar to the college game). Chris Paul has stepped up his game to the level he is the best point guard in the game, even ahead of Jason Kidd and two time MVP Steve Nash. Kidd has yet to demonstrate his talents that have earned him a reputable name, as a Maverick. The difference between Nash and Paul, is that Paul is a prolific scorer and plays smart defense. The Hornets have a solid nucleus of Paul, David West, Tyson Chandler and Peja Stojakavic to lead them deep into the playoffs this year. In my opinion, Chris Paul deserves the MVP for being the team conductor on the number one squad in the Western conference. Standing only a 1/2 game behind the Hornets are Kobe and Lakers. The Lakers have had a lot going for them this year, especially after Kobe’s erratic off season. The biggest thing has been the help they have recieved in the middle. The emergence of Andrew Bynum, the addition of Pau Gasol and the loss of Kwame Brown (now he just needs to leave the NBA and stop embarrassing every team he’s on). While the Lakers have been surging, Kobe has been playing splendidly. Has he been playing better than he has in the previous two seasons? Not statistically. But, he has been a better teammate with the inclusion of Gasol. However he has been better in the past two years than this year when considering his overall performance as an individual player. So far, Kobe still remains on this list: Greatest Players to Never Have Won the MVP. Usually, if there are two players competeing for the MVP, its often given to the player whose team has the better record. In this case, both the Hornets and Lakers are fighting for the number one seed. This will be a tricky season for deciding the MVP and we will here gripes from “media analysts” about both sides. Chris Paul has been a better all around player deserves the nod for this year’s MVP over Bryant. Even in the few games where Gasol went down, Kobe struggled to carry the Lakers on his own (not that he couldn’t have by dropping 81 on some poor team). But CP3 has been more valuable to his team and is one of the best playmakers in the league and should win the MVP this year. My guess is Kobe will win the MVP because he has yet to win the MVP and he is able to get his team to the top of the Western Conference again. If this does happens, it will show us again that the NBA is just horrible at determining the MVP year in and year out (and how difficult it is these days with so many budding stars). What happened to his team??? Should people bash him for wearing that Jayhawk sticker? The Tar Heels just came out flat against the Jayhawks and played one of the most embarrassing games. It was just one of those days and the only black mark on a spectacular season. The main question however is regarding Roy William”s choice of wearing a Kansas sticker during the championship game, two nights after the Jayhwaks thrashed his team. If you are a Carolina fan or if you know something about Roy Williams’ personality, you had to love what he did. The man respects Kansas after 15 years there. He did the same thing in 1993 when he pulled for UNC in the championship after UNC beat his Kansas team back then. Basically, it was a very classy move and something UNC fans should not be surprised about. However, I am curious about how his current players must have taken that gesture? Three straight Final Four losses. A sign of greatness or a major weakness because he can’t get over the last hump? This was supposed to be the year. The Bruins had the big man they lacked in their previous two runs. Florida would definitley not be a problem this year since they were having their own party in the NIT. Yet, Ben Howland just couldn’t get the charm to work on the third time either. Howland is a remarkable coach from his days in Pitt and his recent tenure at UCLA, but I am not sure where the trouble is. While this year’s team was a forimiddable group, they still struggled to get points up on the board and were a bit slower than previous teams. Maybe, Howland needs a new group of guys to gel together or maybe his late game style of coaching needs to change. With Kevin Love, Darren Collison and Russell Westbrook all potentially jumping ship early to the NBA, we’ll see if Ben Howland can change his luck next year. Will he bolt for the Big League again? John Calipari has always had a different mindset in coaching than other teams. He loves the dribble and drive and has brought two unlikely schools to the championship game in UMASS and Memphis. He even had his brief fling with the NBA and his infamous stint as the head coach of the New Jersey Nets. Isiah Thomas may possibly getting booted from the New York Knicks bench and Caliapri might have a chance to redeem his NBA reputation. If new Knicks GM Donnie Walsh is ready to throw big bucks in an offer to Calipari, I see Calipari running the show at the Garden next year in attempt to fix Team Titanic. Will he take the money that Oklahoma State throws at him or does he want to enjoy the Jayhawk basketball tradition? This seems to be the biggest question since the Championship game. Now, that Self has a title under his belt, he can demand even more money whether it be from the Jayhawks or any other team. He says he wants “security” from the Jayhawks. The way I see it, the more he wins, the Jayahawks will do everything to keep him. Kansas has a history of being loyal and treating their head coaches well. I don’t think that Self has anything to worry about from Kansas. The question is whether the 6 million dollar signing bonus and 3 million dollars/year that Oklahoma State is willing to offer, will be enough to pull him back to his alma mater. While Kansas may not be able to throw that kind of money around now, I am sure that they will be able to satisfy their coach in the long run. I think Self should stay at Kansas and forego the few extra millions in hopes of winning more championships in a school with a rich basketball history and tradition. But, hey we live in a time when money controls everything and people always follow the money and never the tradition. If Ok. St. is serious about the offer, I see Self sitting at the Sooners bench next year.